You can track almost any kind of data and then review and reflect on that data to make informed decisions about your productive future. Most people, however, do not. Movements, like that of Quantified Self, whose tagline is “self-knowledge through numbers,” aim to help individuals track data to improve their lives in whatever way they choose. 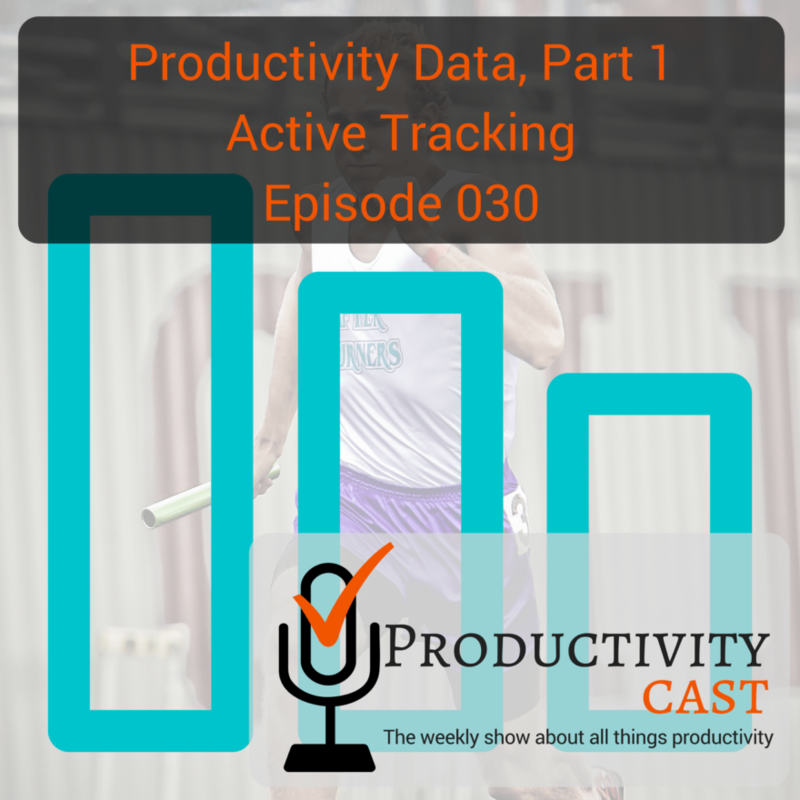 In this cast, the ProductivityCast team looks at the state of the world through the lens of active tracking (versus passive tracking, which we’ll cover in the next cast). We will talk about what active tracking is, how to be a productivity enthusiast with empowered choice, why and what to track, and how to do so with good ol’ pen and paper, or with the latest digital technologies. You don’t want to miss this conversation, so queue us up and listen as we discuss this prime topic of this hyperconnected time and Internet (of Things) Age. Can you be productive in 40 hours? Are you ready to manage your work and personal world better to live a fulfilling productive life, then you’ve come to the right place productivity cast the weekly show about all things productivity here, your host Ray Sidney-Smith and Augusto Pinaud with Francis Wade and Art Gelwicks. Welcome everybody to productivity cast the weekly show about all things productivity. I’m particularly excited about our discussion, but this episode and next episode and and there’s a very good reason why you see everyone identifies their overall satisfaction and fulfillment with their day differently, but there’s no doubt that whether the factor or factors, by which we define our productivity is emotional or logical. It’s all based on data, whether that data is correct incorrect positive or negative doesn’t really matter. Today, thanks to technology and and greater awareness of this more people than ever are tracking all kinds of data. about themselves and then using that data to make informed decisions about their productive futures. However, I think most people. Sadly, don’t purposefully track that data around areas they like to improve and obviously I think they should movements like that of quantified self, which I’ll describe in more detail and a bit their tagline is self knowledge through numbers and aims to help individuals track data to improve their lives in whatever way they choose. So we’re going to have a conversation today about the state of the world through the lens of active tracking versus passive tracking which will cover in next week’s cast, we’re going to talk about what active tracking is how to be a productivity and disease through empowered choice. This is kind of a term of art. I’ve I’ve chosen to use empowered choice why and what to track and how to do so analog digital and or through a hybrid approach. And those of us here on the recording each have our own way of doing that. I think it would be really a great discussion around that as well. So I’d like to start off with a definition of active tracking and why track data for greater productivity at all you know what’s the what’s the purpose. What’s the utility of that. So I’m gonna get started with just just my own definition of active tracking and then I’d like to hear your thoughts gentlemen on the idea and so I’m going to start off with, with just a couple of items that I think are points of or elements of the description or definition of active tracking, which is to say that active tracking is the process of being able to purposefully capture data and then review and or reflect upon that data in order to make impact. this active data that we are collecting could be us not only for personal but also to professional perspective and and the reason I will make the distinction is because the analysis and the use of both are completely different. The professional tend to have more dollars assigns or attach to it. While the personal it goes. objective of quantified self your yourself it’s look from a really completely different perspective. Right. So, so for listeners who may not know, I wanted to actually talk a little bit about quantified self and then I’m happy to respond to your thought there Cousteau because I think it’s salient so quantified self or what some people have called Life logging is the idea of using numbers right using data collection and that includes active and passive collection of data about one’s self in order to make awareness, a regular part of your life. That is the awareness of different parts of your life, whether that be health and wellness, whether that be. productivity, whether that be any number of other particular components of one’s life being able to gain greater self knowledge through numbers as its as its mission or tagline states is the whole purpose and movement of quantified self and so this was a. This was something that two gentlemen based out of San Francisco. They started as a monthly I think meetup or something like that and it has grown into quite a substantial global movement as a disclaimer. I’m actually one of the CO organizers of the DC quantified self meetup. And it’s nearly 1000 members strong in Washington, DC. And so we have statisticians and you know data scientists and all kinds of people who come together as well as enthusiasts, you know, data science enthusiasts and quantified self enthusiasts who come together every month to discuss these various ways in which people are using their data to become better and that includes people who who are tracking their children’s. activities to tracking heart rate to identify health, you know, many, many areas of your life that can be tracked and actually just as an aside, most recently we had a professor come to the University of Maryland for one of our meetups and she talked about an application called Omni track that she’s developed that she created and it allows her to do active tracking she can go in there and identify things that she’s working on and then purposefully put that information in as she makes progress on them. And so there are many, many different areas where this is really, really powerful. And I think you’re right at gusto there is there’s two sides of this right how do I improve my personal life and then how do I improve the professional life. And I think I think we can have a thoughtful discussion around that as well. I do want to make one more point which is to say that I’m a huge proponent of what I called an. What I call empowered choice and I’m sure that this comes up in stoicism or somewhere else in in philosophy before me, but it’s just a term of art that i’ve you know taken hold of which is this idea that today more than any other time in history. We must I think it’s an imperative. We must take the reins in terms of the data that surrounds us and through that sort of, you know, taking control of that data we’re allowed to then make good choices empowered choices right we’re being imbued with the with the information to make good choices, whether they be good choices or bad choices, but we’re we’re imbued with the ability to make choices that we otherwise wouldn’t be able to make without that information and I think it’s really important. I think it touches almost every area of our life from public policy to personal and professional effect. Yeah, sure. I’ll jump in. I I’ve always been a tracker. I guess of some kind. so I had, you know, had a schedule and I take off how closely. I could stick to it and this is when I was about 15 or 16, years old, so I’ve always I’ve loved the idea of tracking and as I got a bit older, I guess I got a little more sophisticated that graphs and different ways to show data so I could understand how well I’m doing it different things. This is totally tied in with the fact that I’m an industrial engineer operations researcher so right in line with my training but what’s great No, it is is that are today is that there’s all these different ways to automatically track or behavior or track different aspects of our lives or health or time or an and they’re there. They were the set them up, but they work even though we don’t have to lend any manual effort so they they they do it for us so. There are people out there, which is great thing about the que es movement people out there who are setting up these probes that we can just turn on and they they they watch what we’re doing and then they report this back some results. So it’s gotten a lot easier I what I don’t think has happened yet, which we’ll talk about later is that we’ve gotten the improvements that we could get from having this technology available. It’s as if the technology is ahead of all our behavior or capabilities so we can measure everything but I don’t think or an actual improvements have kept up anywhere near as much as they could. I think that’s a fair argument that that we are. And I think we’ve talked about this in past episodes, which is that you know there is a learning curve for the general populace when it comes to the movement of technology, you know and and we we all have to be very aware of that. Well, the rash. the hope is that most of that information is actionable, it will be used in dashboards and reports to make clear, concise effective managerial decisions. We all know that’s not necessarily the case but that’s the optimistic way to look at it when we look at personal information that’s a different. Beast because most of the time, at least from what I’ve seen the act of tracking of personal productivity information is more around Hey look, I can track this with no real mindset around what am I going to do with this information once I have it tracked. So is it is it a good thing for an active data tracking absolutely make the conscious effort, but making sure what you’re going to do with it. First is even more important, because otherwise you’re just creating additional tasks for you to do those tasks are to track the data on the tasks that you’re doing. So that’s where I’m thinking about it. Yeah, I think, I think we’re all on the same page when it comes to that and and i think that brings us to the next point of discussion on this cast, which is to talk about what can you track actively and really what should you do. on the sense of writing because one of the things I learned is that it’s not about the quality of. What you’re writing daily. It’s about the fact that you’re writing daily. So it is important for me. And then as a day to know I write because my optimistic brain tend to think that I always write a lot more words than actually did so it helps me to keep myself in track of when you really didn’t write that much. the watch a strong case or an excuse justification. I know Joe. I’d been working is standing up for. since I got my watch is the only measure I have hit every single day. and I’ve been doing that for a while, but now I track was the watch and it’s been interesting to discover how many of those even was the alarm I escaped. I have a couple of things. One is I have a.
checklist that I go through each morning. and it tends to work, you know, for the most part, what the chain methodology. Don’t break the chain right but the but the real interesting one that I’ve been trying lately is to keep myself on schedule so that what I’m doing at any time. random remainder program called remind me, I think, and it remains me on a random basis to it sort of probes and asks, Are you on schedule and I if I hit the yes or confirm or something, then it records it as a yes if I dismiss it It records it as a no and it got us this data and then accumulated over however long I wanted to that I can download it from there to my laptop and analyze it. So I’ve done a little bit of analysis to see how how bad I am at this. Exactly. And sure enough, it’s worse than I thought I was a baby half the time I’m on schedule and. for this show. So if anyone wants to follow what I’m doing. They can do there. And again, it’s it’s about empowered choice. Right. and partial success on that. Yeah, because it should be fun right to do this kind of thing, it’s not it’s not some that are probably a couple of listeners who are listening and thinking oh my god what’s a geek. if I can make it fun and have it be a game and the same link that I mentioned mentioned the fact that I started measuring this metric as a part of a group. So I set up this game invited some people to play the play. As you know, as a.
group to put it all together for a month and do it all together for a month makes a huge difference. You know, having an audio compare having competitors or colleagues were playing the same game makes a huge difference doing it on my own is just in an invitation to slough and laziness and forgetfulness, and oh yeah I really should be doing that so gamification I think helps them we’re trying to do any kind of active tracking for any purpose. Okay. I was thinking about this what what do I actually do versus what is being surreptitiously tracked about me and there’s three main things that I came up with one. I think we all in some way, shape or form. We’re doing this anymore, which is the health related tracking between my little Samsung Gear Fit and the app that’s on my phone and another app I use called Life some I keep track of all those normal vital statistics that seem to be the standard anymore that anyone who is actually operating in this world. needs to keep track of. I do like the fact that some of the applications have a little bit of that gamification type of feel so there’s badges and things like that that you can earn as you have gathered information. So that’s one thing and that helps kind of given the second is professional compelled by profession to do things such as tracking hours on a weekly basis. So that’s pretty much a given and that’s a conscious effort. It’s I’m not utilizing any tools that automatically keep track of the work that I’m doing in the background. I’ve looked at a couple of those. They’ve just never worked because I’m very interrupt driven. So I’m I wind up changing gears so quickly that it almost becomes a burden to to do that. So I wind up having to backtrack although I’m sure I can do that better. And that’s something I’ll be looking at next year. The third one is around my actual task and to do type of activities and I have a specific tool. I’ve taught. about it before to do is that I use for this primarily because it does some of the things that Francis mentions it gives me the ability to if I’m going to track activity. I need to be able to track that I’ve gotten things done and then I’m continuing to get things done, especially around habitual items. So being able to leverage capabilities such as recurring tasks and reminders and location based triggers and then have the successful completions of those aggregated together in ways where I can see from a charting perspective that I’m making progress or I’m not making progress and get that reinforcement. Those are active but and i’ll i’ll caveat a little bit that is more of a blurring of the line for me between active and passive the tracking happens because I complete the tasks, but because I complete the tasks. It doesn’t necessarily mean that I’m going to pay attention to the tracking. I have to actively look at that data. So when I think about the things that I’m actively tracking. It’s not only the things that I’m capturing but what are the things that I’m actually processing through and then interpreting the reports coming back and being able to adapt and configure accordingly. which is that I’ve been tracking my daily hours basically from 8am to 8pm for the past nearly 20 years you know and I have I have been I had been tracking it for many, many years in an Excel workbook just, you know, I just. emotional state of being mood and otherwise. And then I started tracking that and that became perhaps a little bit too cumbersome for me over time. And so I scaled it back to just tracking my hourly time and then I moved on from there to tracking in a wide variety of different tools for different things. So today I use going back to to your thoughts Francis about making things fun and and I will probably say that I disagree, to some extent, that just some of this stuff isn’t fun and that’s. the whole concept of illusory attitude is is good but not everything can be fun and I just I recognize that some work is just hard work and drudgery but it needs to be done right. So anyway, but the but the point is now I use for the game of fighter approach to have a development. I don’t use it at all for the task management components. I only use it for habit development and tracking habits and so I actively track there I track a whole bunch of stuff in my world. And again, because I’m in that quantified self world I do so nutrition my physical fitness activities I journal so that I’m handling mood tracking for again effect and and a number of other different kinds of mental, emotional states and I’m tracking that actually in Evernote right now. And, and then you know I’m I’m tracking the number of words that I’m writing per day. And that can be really helpful for authors bloggers screenwriters and so on and and so I’m tracking a wide variety of information. I didn’t want to know two areas of active tracking that listeners might be able to do that could be really useful. I was actually listening to a talk at Google. And I will put a link to this in the show notes show notes so Eli Finkel who is a PhD researcher and I’m forgetting the university. He’s based out of but he has been doing these marriage studies as all focuses on on studying relationships and marriage and he’s just recently written a book on this topic and was being interviewed or having a discussion about this at this talk at Google. And he was talking about this idea of doing a relationship journal that was based on gratitude, a weekly practice of. what items your partner has done this week to show their commitment or positive you know feelings toward you and the relationship and that this one intervention was really positive it provided a really good sense of the relationship over time. So this idea of doing a gratitude journal specifically for your spouse or partner and what they’re doing to help the relationship was a really great way to track actively and it actually produced an immediate not an immediate but I mean a benefit that was quantifiable based on this research study that he did another area that you can do tracking is in GitHub. If you’re a software developer or interested in software development, you can track the number of commits or lines of code that you’re putting into say GitHub or other kinds of repositories. So it could be a lot of fun to kind of see. How much you actually commit I was talking to a software developer and he was talking about kind of the the shyness about working in a web development field and having having others looking at your GitHub profile or account to see how many commits you’ve done to GitHub and it’s kind of, you know, people are watching you, in the sense that you know your either your employer managers or your colleagues are paying attention to how much you are producing through this. So there’s a there’s a kind of double edged sword to that right because it can make you feel a little bit anxious about the fact that, especially in that world where you’re doing a public project and people are kind of paying attention to you, but that also is a good motivation for you to go ahead and and be doing your best work is kind of a way that you can look at it. I wanted us to move along in the conversation to all of the various apps and tools. Generally, that we can use. Whether that be analog or otherwise, to be able to capture this this data and what areas of life and work you can capture that data within or capture that data for, you know, I’m pretty simple on as I said was the Apple Watch. I led the Apple Watch on application track this stuff allows me to go and look at the information that I need for my writing. I have simply use I’m Excel or a numbers sheet for the longest time, so I have never tried to look into a different. It may not be the most fashionable one but it synchronize on every device. It’s easy to log in and if I want to geek out for a recent fine average and other things I can do it pretty simple. So my tracking it’s happened mostly on an Excel sheet. Fair enough. It’s a it’s an oldie but goodie it’s a solid tool. Like I said, You know, I did for nearly 15 or 16 years I used a basic Excel workbook for tracking most of the information in my world and I even created a GTD template and system completely within Excel and I’ll put a link to this in the show notes if folks want to check it out. But I created the GTD you know system in Excel or Google Sheets whichever one you want to use it and and I did a video tutorial so people can see how to set up entire productivity system by tracking your information all within the Excel workbook. So yeah, totally, totally cool to have a have a a spreadsheet or workbook style tracking system. Well, here’s the thing right in five years time, if we were to ask the same question what apps are there we we couldn’t have a show that could cover the hundreds of apps that would exist because they’re being created every day and we’re adding on more and more and more of them. And there’s a million different ways to. A probe and gather data from different things in our labs. I think we’ve we’ve already gotten to the point where an app an app an app that can measure something that may be of interest is is an approach that doesn’t it’s not scalable, but it’s the it’s the boil the ocean approach where you gather as much data as you can in the hope that my gathering all this data, you’ll be able to mine all of it, be able to be able to tell you something about some insight into some aspect of your life that may be helpful. So that approach, I think is is we’re at the I think we’re already at the end of it, to some degree, which is why the quantified self hasn’t caught on in terms of the mainstream. I think we need to look at the Art mentioned or goes to accident, which isn’t which is that we consultants typically don’t go in and just gather all the data that they can and then mine is looking for looking for arbitrary answers. that goes data that goes data that use data that you the data that you don’t need the point is to stay with the problem long enough until you actually get a solution. I think that that the hypothesis driven approach versus the boil the ocean approach. Actually, I kind of mentioned it, and I didn’t mention it in the article that I’ve added to the show notes, but I think it bears more fruit and I think. I with you i think that i think that there are certainly more problems to solve than there are apps available for them. And I’m, I’m, I think in in at least today’s you know episode we are attempting to give people options to use that they can. you know, use a solve through the use of an app. When the problem may be more sticky than that, you know, when it may be more multifaceted than what they’re trying to solve. You know sometimes people try to use an app to solve something simplistically when that’s not necessarily the most elegant or rational solution. I guess that may be the best way for me to sort of think about that. Right. Sometimes the data is just is just manual rather than through an app. but but I think that the skill of doing the problem definition and then the the part that we’re sort of missing in the mainstream. Yeah. So I think your your argument is that people should think more about the problem before the. we’ve talked about all kinds of crazy apps and he’s absolutely right. There’s hundreds of them out there I run several communities and just the list of apps that people have identified and they find new ones and new ones drop off the room. That’s great. All right, I’m going to tell you to put your phone down, turn the device off back away slowly from the computer walk away from the technology, get a pencil get paper and if you can track your time. That way you’re headed in the right direction. And the reason why I say that is is because we all get lost in the philosophy. and it dovetails with Francis’s point if you understand the problem. It’s not the tool that’s going to make the difference. If you don’t understand the problem. It won’t matter what tool you use. so I always carry a travelers notebook with me. I always. because we all complain that our hit writing isn’t any good I I so agree 100% in fact that some of the coaching I give people is that they should use PayPal until they can’t stand it any longer. And then they could switch over to an app because that the use of pencil and paper sort of forces. who it’s for stuffy hand write something he need to review it, you know, before too long. Otherwise, nobody will be able to understand what I wrote. called good notes on the iPad and with a combination of that and the pencil I have never before. stuff and I see the have always seen the power is just I I’m not willing to carry another notebook, because we’ll make the better. capabilities Tyler’s so Samsung s3 habit, the chrome pixel book has said there is two or three of them who have a really good equivalent to what the pencil on the apple platform is but it’s it has been something really interesting from to an interesting tool I add to my to my list. Yeah, I think today more than ever with a stylus and a tablet or a fat wallet. You can take pretty good notes on screen digitally. I think that again. For using it. If you are not going to review and reflect upon that information and make improvements based on it, but I do. And for those of you who do do that I’ll give a couple of options with regard to some of these things. One, I can’t help but say this as an Evernote certified consultant Evernote is a great tool and if you’re on the iOS platform on iPad. There’s penultimate which is a great note taking application that you can synchronize automatically with Evernote on the on on on a couple other areas of life. I know that many clients who have been thinking about weight loss or some kind of fitness improvement use a tool called lose it and I’ll put a link to all of these in the show notes, obviously, but lose it is there for those who want to do a fitness program and weight loss program I’m by myself. Use My Fitness Pal, which is a an application owned by Under Armour and it allows you to track nutrition that is you can scan the barcode of food you can. quickly search for different products or food if you’re like at a restaurant, it’ll know the database will know you know what foods are at restaurants. Usually, and you can even add custom foods in. So if you make yourself a particular type of shake or use bulletproof you putting butter in your coffee you know it’s going to it’s not something that’s like it’s likely not something in the food database so you can go ahead and add it as a custom food in your system. And I love that it like knows the regular foods that I eat and therefore goes ahead and tracks that information for me so that I can easily enter it and it connects to map my run. I’m a runner so it you know connects to my running app. It connects to Google Fit and I believe it also connects to Apple Health someone can correct me if I’m wrong there but I believe it also connects to Apple Health. So you’re capable of tracking that data is centrally so it tracks against all of those things and I just really like it it’s it’s an easy app to use it tracks exercise. And hydration. So you can you can track how many glasses of water. You’ve had today and or ounces of water, you’ve you’ve you’ve had in a particular day, and that’s you usually very, very helpful to me as I said earlier in this cast I moved from tracking my time in Excel to other applications and one of those other applications is toggle to GG L and this is a time tracker that has reporting built into it and that’s really important and imperative. I think for most people who are going to use their own data for time tracking you really need something that is going to be able to show you a a a dashboard or some kind of report. Now I will make note here about a couple of different things here. One is that the ease of use of the app in terms of capturing is really important. I don’t think you should you should, you know, use an application where it’s more effort to capture than the benefit for the data that you’ll get out of it. And on the flip side. side of things don’t think that just because something provides you with pretty visuals like pretty visualizations that that’s actually useful to you. Okay. Remember that analysis and synthesis of data is is actually the more challenging the analysis and synthesis of the data to a point right there’s an upper limit limit where then if it’s jibberish to you and makes absolutely no sense that’s not useful or if it makes you not look at the data altogether. That’s not useful but below that the challenge of looking at the data is actually where the learning process begins. So if the data is just too easy. You’d be you’d become too. You start to tolerate that information and then it becomes useless to you, so don’t Don’t you know think that just because the data is easy. Oh, I weighed myself now I know the weight on the scale. Oh look, I know how much I ate today. Look at the look at the pretty visuals. They. of proteins to fats two sugars and simple carbohydrates and otherwise right that’s not that’s that’s okay. But at some point it becomes what’s the what’s the challenge. What’s the thing that’s going to make you change your behavior and that’s going to be the thing that’s most important is what’s the challenge. So I just want people to be aware of that, that, you know, just because you have an app for active tracking doesn’t necessarily mean that you’re going to make good changes in your life, you need to really look at the what the data really means and overcoming things like confirmation bias and poor statistical analysis you know they’re there are things built into these apps that are not necessarily doing all of the work for you. They can’t provide you with all the answers. Sometimes the app or following the app continue in the in a direction that doesn’t lead you towards solving the problem that you want because. app makes it easy to gather the data. So I think there’s a gap between defining the problem on paper sort of the way art said and finding an app that can help you to gather the data and they may not be a nice perfect match between the two. It may be something unconventional like the app that I’m using to give me the random reminders isn’t meant for the purpose that I’m using it for but it works. Anyway, so sometimes the app me the app developer may not have anticipated your needs. But because you have saw define the problem well enough, you can still use an app for another purpose for your purposes. So again, going from the problem towards the app as opposed to from the data to the problem. think on the wide you’re tracking and the what you’re trying to accomplish out of that. Otherwise, it’s not important. So for. Sample before I got the Apple Watch. I never track how many how long I was standing up. I knew it was standing up enough now the watch to it automatically. And I can tell you but but it wasn’t an important and relevant information. So not every piece of information that you can track. It’s going to be relevant to what you do. Keep that in mind. get ideas get information but don’t feel like you have to go about this on your own. This is a type of thing where you’re looking at a major life change if this is highly successful and getting feedback on what you’re doing is critical for this working out. This has been a great conversation. I think it’s been really helpful for people to look at this from each of our different perspectives on the concept of active tracking and as I said next episode we’re going to be talking about passive tracking the idea of information that’s being collected without our direct intervention our direct capturing of that information and so I look forward to that conversation and to sharing that with you all the listeners. So do you have a question or comment about this cast something we discussed in this cast or otherwise about personal productivity, please visit productivity cast dot net forward slash contact or head over to our productivity cast Facebook page and let us know they’re in the comments. Go ahead and like the Facebook page comment on this cast. Let us know your thoughts and comments and questions and we’ll be happy to interact and engage and answer your questions there or hear on a future episode. You can find this episodes show notes and how to subscribe at productivity cast. dot net forward slash 030. That’s the episode number and if you could please add a rating a review in iTunes to help us grow our personal productivity community of listeners. So thank you. That brings us to the close of this episode of productivity cast the weekly show about all things productivity. I want to thank acoustic pronounced our girl wicks and Francis wait for joining me here on today’s cast and here’s a productive life. Thank you, gentlemen. And that’s it for this productivity cast the weekly show about all things productivity with your hosts, Ray Sidney-Smith and Augusto Pinaud with Francis Wade and Art Gelwicks.